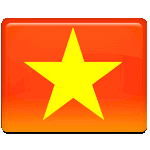 National Day of Vietnam is celebrated on September 2. This holiday commemorates the end of the Japanese occupation and the country's independence from France in 1945. Vietnam became a French colony in the second half of the 19th century. During the Second World War, its territory was occupied by Japan. French colonial administration was kept in place as a puppet government, but Vietnam was in fact ruled by Japan. On August 15, 1945, Japan announced its surrender in the Second World War. The defeat of Japan created a power vacuum in Vietnam. The independence coalition Việt Minh led by Hồ Chí Minh took advantage of the situation and launched the August Revolution to seize power over the country. Japan formally signed the surrender documents on September 2, 1945. That same day, Hồ Chí Minh officially declared Vietnam an independent state. The anniversary of this event was designated as the country's most important national holiday. Vietnam National Day is celebrated nationwide with military parades, solemn speeches, firework displays and other festivities. The largest march is held at the Ba Đình Square in Hanoi, where Hồ Chí Minh announced the Proclamation of Independence of the Democratic Republic of Vietnam on September 2, 1945.